Yes, I had to do a search for how to get a screenie in Windoze. MAC OS 4eva! Also note that I'm following John McCain (even tho he can't use the internet, he's on twitter -- or at least his staff is). So I don’t profess to be any type of expert on twitter, but I have been playing around with it for a bit. As I’ve been getting some questions from some of you, I’ll attempt to go into it in some detail. Twitter is similar to both social networking and instant messaging, but differs from both in some important ways. Unlike social networking, you can follow pretty much any one on the planet with a twitter account, and see what they’re up to, should they choose to share that information. They don’t have to give you permission. Unlike IM, its not quite as instantaneously conversational, and your messages go out to everyone who is following you or does a search for you, not just one person. Twitter has been described as a FB status update without the rest of FB, which is once again, a partial description of its features. For you see, the most important thing to remember about twitter is that it is evolving. Once again, let me point you back to the singularity. Twitter has morphed from a series of status updates, or a micro blog, to an engine which runs on its own, and around which applications or functionality can be built. These apps and functions can then be used to conduct market research, media research, or keyword searches on topics of interest. These applications exist as separate sites which act as a layer or lens on top of the twitter engine itself — twitter is a entity with a life of its own, but these applications allow you to interact with it in different and more useful ways. Let’s get into some of the different apps that are out there right now. Twitscoop: I’ve mentioned twitscoop before. Its an engine which displays keywords which are “hot” at that particular moment as information or topic clouds. You’ve probably seen topic clouds before, and not known what they are. Twitscoop is basically a measure of what people on twitter are tweeting about at that particular time. Twitter Search: Twitter search allows you to search for keywords, and find out what people are saying about those keywords at a certain time. Similar to clouds, but perhaps more useful from a marketing or news research perspective, as you can narrow your search to topics that are of interest to you. For example, imagine if your company were embroiled in a nasty legal battle. You would want to keep track of your company in the news, and as talked about by the general public — a twitter search can do this for you and update the results in real time. These days, more and more of social media is dependent on listening as well as communicating, especially in a corporate environment. 12seconds: Video on twitter? Yes, as long as its 12 seconds long or shorter. A new feature, but the possibilities are endless — share your videos with the whole world. Citizen journalism, anyone? Snaptweet: Same thing but with pictures. Stocktwits: Stocktwits describes itself as “an open, community-powered investment idea and information service. You can think of it as Bloomberg for the little guy and gal.” Can you imagine how this will change the face of investing in the stock market and trading, once it really takes off? I mean talk about real time information exchange and tending towards a perfect market — the next financial crisis can be even BIGGER with stocktwits. Tweetoclock: What time is the best time to tweet Shaq? Tweetoclock knows. Not sure how accurate this is, but basically this tells you what best time to contact any twitter user is depending on past usage — all you need is their username. All times are in GMT, so don’t get too confused. I’m a Wednesday 9pm kinda guy. So all of this is quite a lot to get your head around — how do you keep track of it all? When one goes to twitter.com, one sees a very simple interface — something like instant messaging like it would have been back in 1991 or something. Doesn’t seem very user-friendly. Well in order to manage all this information, there are several “clients” or applications that allow you to run twitter from your desktop. 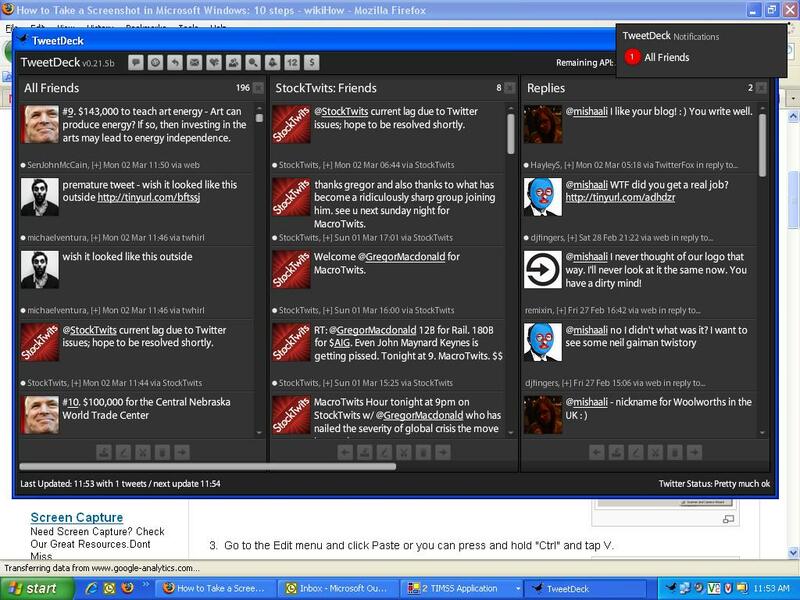 I personally use tweetdeck, but twitterrific is also comparable. For your mobile device, try twitterberry or twitterrific mobile. If you choose to start twittering, it’ll take some time for you to figure out what to do with it — if you’re using it for professional reasons, it might come to you a little quicker, and you may use twitter as a voice and an ear for your cause or company. I’m still trying to figure out the full potential for twitter, but I’m getting glimpses into it, and those glimpses are pretty extraordinary. My recommendation is just install it, add your friends, and fool around with it. Eventually, you’ll find a use for it, even if you’re searching for #truelove. You guys know how to get in touch with me — if you wanna twitter me, drop me a line on here or FB and I’ll give you my username. See you in cyberspace (CHEEEEEEESE!). Next time — twitterlingo — the syntax of twitter.